Under sink water filters take up no counter space and can provide a high level of filtration. Under sink water filters are a popular choice because they provide good filtration and water flow, and they do not clutter the countertop or sink area. These water systems usually require professional installation. They also require space under your sink. So make sure you have enough space for the filter system you choose. The most effective under sink filters use a multi-stage filtration process, which may or may not require more than one filter casing. More casings take up more space; thus, you will want to take this into consideration when choosing one of the under sink water filters. These systems attach to the cold water pipe, and a separate faucet is usually installed on your sink or countertop. Some models can be hooked up to the existing sink faucet. Even though the reverse osmosis under sink filter systems are very popular, we do NOT recommend them. Read more on the advantages and disadvantages of drinking reverse osmosis water. The filters usually last 2 to 3 times longer than faucet mounted or countertop filters, thus saving time and money on filter replacements. The water flow with under sink filters is generally faster than with faucet or countertop filters. The higher-quality under sink models use multi-stage filters that remove many water contaminants. These filters improve water taste and reduce odors. They have very little, if any, water waste. Installation of an under sink filter usually requires a professional to help with installation. They tend to be a bit more expensive than faucet and countertop filters. Because of the heavy use these filters get, the under sink filters that use plastic fixtures tend to break or leak over time. There are quite a number of high quality under the counter water filters on the market so it was too hard to narrow it down to just 3. The choices depend on the degree of filtration you are looking for, how much space you have under your sink, and how much you are willing to spend. I recommend the following 6 under sink systems, based on the quality of their filtration, product certifications and ratings, as well as customer reviews. Note: Online discounts are often available for all of these products. Just click each product link below to view the current monthly discount available through my website. Aquasana’s under counter system uses NSF Certified Claryum™ filtration technology to remove over 97 percent of chlorine and chloramines, in addition to lead, mercury, asbestos, herbicides, pesticides, pharmaceuticals, volatile organic chemicals (VOCs), MTBE, and chlorine resistant cysts like cryptosporidium and giardia, reducing over 60 common water contaminants. These filter systems leave in healthy minerals for optimal health and hydration. The Aquasana filter was rated best buy in 2010 by ConsumerSearch.com and “healthiest product” award by Healthmagazine. These filter systems have a 500 to 600 gallon capacity, last 6 months, and are a great value for the price. 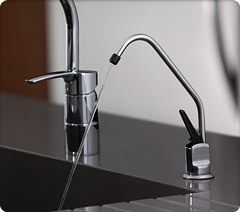 Note: The Aquasana Under Counter Water Systems offer a choice of chrome, brushed nickel, or oil rubbed bronze faucet finishes to match your kitchen fixtures. Crystal Quest offers single, double, and triple casing under sink systems, depending on your filtration needs and under sink space. These filter systems provide up to 8 stages of water filtration. Even CQ’s single cartridge under sink system offers 6 stages of filtration and removes numerous contaminants. You also have the choice of filters which have 10,000, 20,000 or even 30,000 gallons of filtering capacity, making these filters last much longer than other under sink systems. Imagine not having to replace a water filter for 5 years! The Pelican drinking water systems have a filter that has been certified to to NSF/ANSI 42 and 53 for the reduction of chlorine, chloramine, lead, cysts, mercury and VOCs. In addition they filter over 60 known contaminants. The Pelican drinking water systems have a unique modern design and include an LED filter life indicator for 450 gallons and last approximately 6 months. They also offer a 90-day satisfaction guarantee and a 1-year warranty against manufacturer defects. The Watts under sink system uses a 3-stage filtration process, which is NSF certificed to reduce sediment, lead, chemicals, chlorine, cryptosporidia, giardia, as well as a long list of herbicides, pesticides, and volatile organic chemicals (VOCs). What I like best about this system is the quality and durability of all its parts, including the brass fittings. The system also has a unique “swivel-valve, push-button assembly that allows for easy installation,” as well as simple one-step filter changes. Filters needed to be changed every 6 months. This system has high customer ratings at Amazon.com. The Culligan under sink system is the most affordable under sink system that I recommend and it still offers pretty decent filtration. This filtration system is also NSF certified and reduces bad taste and odor, chlorine, sediment, lead, cysts such as giardia and cryptosporidium, turbidity, mercury, particulates, VOCs, MTBE, asbestos, and chloramines. The system comes with “quick connect fittings” for easy installation. The filters have a 500-gallon capacity (about 6 months). I also like the fact that this system comes with a 5-year warranty. The UltraDelphi under sink system provides excellent filtration but also the additional health benefits of ionized water. This system uses the most advanced internal ionizer filter available, and optional fluoride/arsenic removal pre-filter. The system has five advanced electroplated platinum-titanium electrodes, backed by Emco Tech's 30+ year reputation for quality and durability. The system has an LCD indicator which will display the numerical level of pH water you have selected. The system has a self-cleaning system which effectively reduces mineral scaling from the electrodes.